I've been using for a while, but recently when I try to use 'send to kindle' I get a 504 Gateway Time-out error. Is anyone else having problems? I am installing this docker and when i launch the UI it goes to /config and asks for database location. Is this a pre-defined path, or do i just put in where i want. No matter what i try, i get a 403 forbidden error and this in the logs. I entered /books into the config for the location and got the same error. I dont have a /books_library path in my setup? Do you have a metadata.db file in /mnt/user/media/e-Books that's been created by your calibre app/docker? I think I have the second path from when I created myself - for some reason it's down as required. I'm going to leave it alone as I don't want to miss up the history of users. Just went back to the WebUI and refreshed it, now its presenting a login. is there default login? that's probably your problem. Add some books to your library using your calibre app/docker and I think your problems will go away. You do have calibre running somewhere else right? This docker is just a nice ui sits on top - you still have to run calibre somewhere else. Ah gotcha, thats probably my issue then, I thought this was all self-contained. is there a calibre docker you would recommend? I use the RDP-Calibre docker and the linuxserver lazylibrarian docker. It's a shame that books aren't as well supported as say movies or TV shows. Hopefully somebody will build a sonarr based service for books - it's a real pity that the lazylibrarian guys based their service on headphones rather than sonarr. All your issues are covered in the readme linked in the first post. Recommend you all update to the latest container version due to the discovery of a vulnerability. When I try to use advanced search I get the following error. I'm trying to utilise the custom columns I have in calibre and saw that you need advanced search to use them. 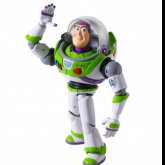 First of all, I would like to extend a thanks for this wonderful docker. I wanted a nice way to share my library with friends and family, and this fits the bill with elegance, however, I seem to be stuck with one aspect of the docker -- the E-book converter. I am utilizing the RDP-Calibre docker from aptalca to manage my library, and this Calibre-Web docker configured through a reverse-proxy using Letsencrypt. Since I and family members have KIndle's, I would like the ability to convert my Epubs to mobi and email directly from Calibre-web instead of doing through RDP-Calibre. I initially tried to use calibre's ebook converter as I assumed it would be included in the docker but unless I'm mistaken, could not find it installed. I bashed into the docker and looked everywhere. I even tried to install the calibre package following the directions on this page to no avail. I thought I was close following the manual installation instructions below but could not install the "calibre_postinstall" executable, which I'm assuming installs the dependencies required to get Calibre's bundled "ebook-convert" binary to work. At this point, I gave up and figured I'd download kindlegen from Amazon and give it a whirl. From the docker bash shell I am able to run it with no issues, but when I click on edit metadata for a given Epub book, the convert options are not there. 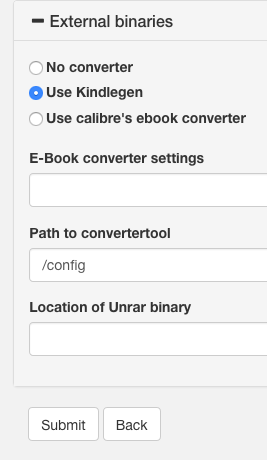 If I select use calibre's ebook converter again, they show up even though I don't have a working "ebook-convert" binary -- go figure. @phorse Here's what I did to get the kindlegen binary working. 1. Downloaded tarball from https://www.amazon.com/gp/feature.html?docId=1000765211 to the docker config folder. Hopefully that gets it working for you. I tested the convert and send feature to my email and it worked fine. Good luck. I've got what I think is everything setup between LazyLibrarian and Calibre-Web but I seem to be at a loss for Calibre-Web to notice an updated book. LazyLibrarian deposits the book in the same folder that Calibre is looking at but I don't see an option to "update" Calibre to reflect the new book. Unless I'm blind, which I'm open to being. Does anybody have a good config to set up a reverse proxy? I guess I should have been more specific. I was hoping to get a subfolder version and not a subdomain. Regardless, thank you for responding. 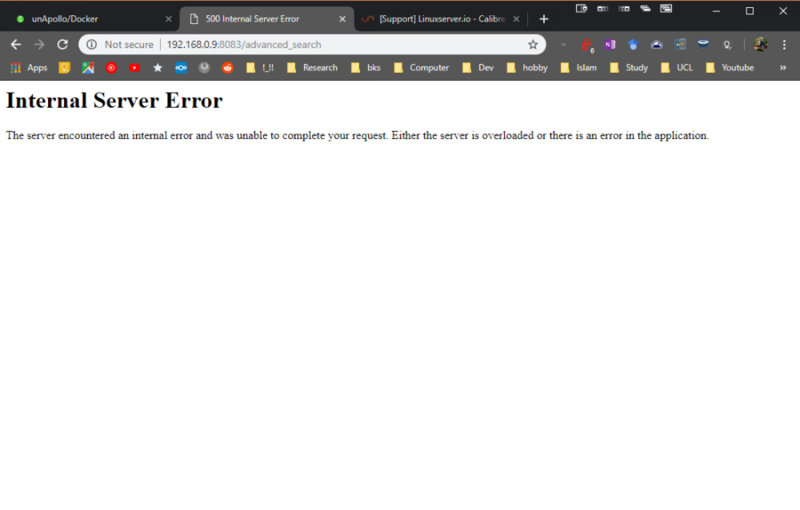 Has anyone received an internal server error when selecting a menu category? I am getting the below error when I select author, series or category. I have tried rebuilding the database with no luck and it works fine in calibre.